Background: Toll-like receptor-2 (TLR2) and Toll-like receptor-4 (TLR4) have been reported to play a crucial role in tuberculosis, however, little is known about their expression in tuberculous pleuritis. Objective: The goal of this work is to explore the expressions of TLR2 and TLR4 in tuberculous pleuritis and their predominant expressions on cells. Methods: Levels of soluble TLR2 and TLR4 by enzyme linked immunosorbent assay (ELISA) in 58 patients with tuberculous pleural effusion (PE) and 43 patients with malignant PE were determined. 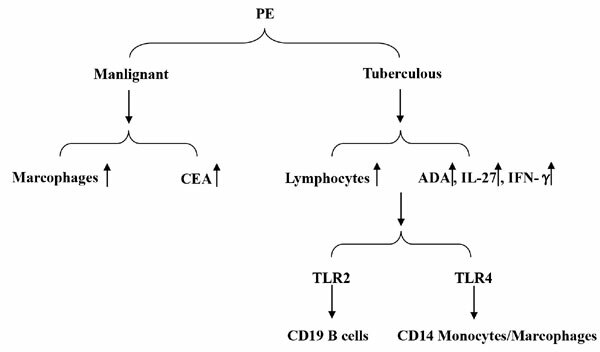 The related genes were analyzed by RT-PCR and the membrane expressions of TLR2 and TLR4 on CD3+, CD14+, and CD19+ monocytes were assessed by using flow cytometry in 20 of 58 patients with tuberculous pleuritis. Results: Our results showed that the levels of ADA, IL-27 and IFN-γ in tuberculous PE were obviously higher than in malignant PE. Moreover, the concentrations of soluble TLR2 and soluble TLR4 in PE were significantly higher than those in peripheral blood of the same patients, as well as the levels of soluble TLR2 in tuberculous PE were significantly higher than those in malignant effusions. Furthermore, the levels of TLR2, TLR4 and IFN-γ mRNA expression were marked increased in the tuberculous PE when compared with the correspondent serum. Importantly, we found that the predominant expressions of TLR2 in monocyte were on CD19 B cells, and the predominant expressions of TLR4 were on CD14 monocytes/macrophages. Conclusion: Our findings provided the evidence of a role for TLRs expression in tuberculous PE. Lipopeptides, lipoproteins, pleural effusion, peptidoglycans, respiratory diseases, tuberculosis, TLR2, TLR4.